A new book on creating and delivering effective business presentations. 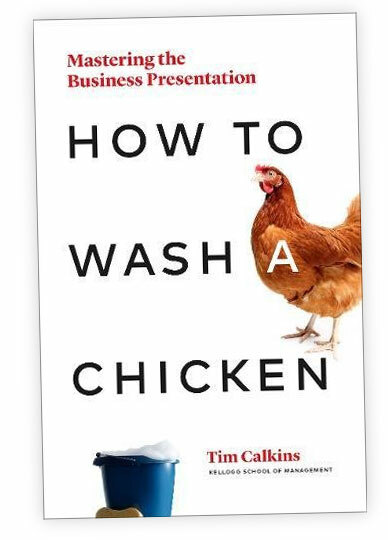 How to Wash a Chicken is a practical guide to creating and delivering powerful business presentations. If you read the book and use the ideas, you will present with confidence and build your career. "Presenting is perhaps the single most important skill one can learn as an up-and-coming executive. Tim offers great, practical advice on how to radically improve." "Few individuals can capture an audience like Professor Calkins. This book is a powerful tool that will help you prepare and deliver epic presentations, both personal and professional." "Tim Calkins’ book provides practical advice on how to prepare and deliver presentations that will make the difference when opportunity meets preparation. A must-read for first-time presenters and business pros." "Calkins reminds us that there is a process and structure for creating compelling presentations that will advance your ideas and your career. If your job involves selling or persuading, then you will benefit from applying the lessons of this book." "Tim Calkins is known at the Kellogg School of Management as one of the best presenters. His tips are simple, easy to remember and valuable even if you consider yourself a master of presentations." How to Wash a Chicken – Mastering the Business Presentation is a practical guide to presenting well. The book goes through the entire process, from deciding whether a presentation is necessary to creating the story and delivering with confidence. Grounded in research and years of experience, How to Wash a Chicken is packed with insights into what makes a presentation work and how you can become a more effective and confident business presenter.